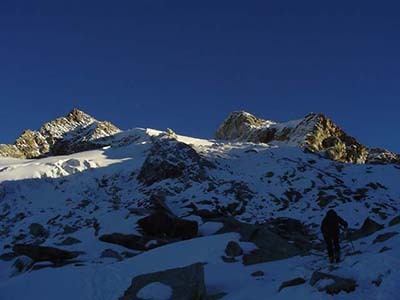 Urus Mountain is located in the valley of the Cordillera Blanca Ishinca with altitude (5495 m). It is regularly visited by tourists from different countries. Climbing this mountain does not require any experience and it has a beautiful view of other mountains such as Tocllaraju, Ishinca, Akilpo, Churup, and others. Our bus will depart early from the city of Huaraz northward reaching the village of Collon and from here will start a short walk to reach the base camp. Camp is located in the valley of Ishinca and we will stay here overnight. This day will leave the base camp early to head for the snowy Summit of Urus. From this snowy area we will see different peaks of the Cordillera Blanca, then we return to our base camp. This is the last day in which we will walk from base camp to the village of Collon. There a bus awaits to return us to the city of Huaraz, concluding the tour.